Climbed on June 1, 2008. 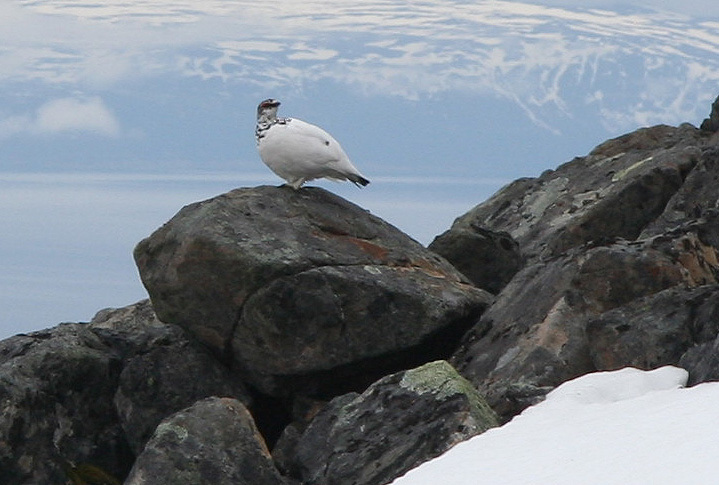 From Tromsø, drive E-8 to Fagernes (24km), then Hwy. 91 (24km) to the ferry at Breivikeidet (1 hour). 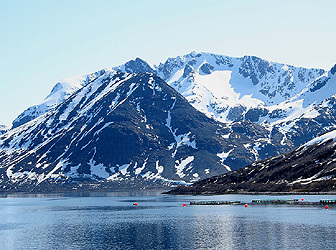 Cross to Svensby in Lyngen and continue to Lyngseidet where another ferry will take you across to Olderdalen and E-6. Check the ferry schedules, an alternative is to drive E-8 to Norkjosbotn, then E-6 to Olderdalen, this is only slightly longer in time. From Olderdalen, continue 35 kilometer north on E-6 to Langslett where Hwy. 866 forks left. Drive 29 kilometer on Hwy. 866, crossing in a subsea tunnel to the island of Kågen. You should now be in Storbukta (marked on the M711 map). The river Storbuktelva comes down a small gorge on your left and immediately beyond, there is a small road heading uphill. Park here, this is the trailhead, location N69:59.874, E020:53.833, elevation 22 meter. Route description: From the trailhead, follow the old road uphill as it follows the right (north) side of the river. Higher up, the terrain becomes more level, there is a small (local) hill up front, continue straight west and go uphill with this little hilltop on your left hand side. There is a small pond near the saddle just north of this small hill. Storbuktvatnet (318 m) is now below on your left side. Descend a little as you contour the slope on the north side of this lake, then climb the slope on the west side of the lake and gain the saddle that is marked as 496 meter on the M711 map. From here, the real ascent of Kågtinden starts. There are cairns indicating the best route. This route climbs rather gradually while doing an ascending traverse in order to get across to the most distinct ridge coming down in a south-west direction. It is best not to ascend too high too early. A good waypoint may be location N69:59.671, E020:47.386, at elevation 814 meter. From here, head straight uphill, this is the steepest section of the entire route, still quite manageable. Above 900 meter, the slope becomes more gentle while a steady ascent continues until you are almost at the top. Near the summit, the cliffs will start to get closer on your right hand side. There is a very short, shallow and somewhat more narrow col before you step onto the summit block. This section poses no difficulties whatsoever. There is a small metal sign reading the name and the accurate elevation just before you reach the highest point. Comments: I stayed at hotel Maritim in the small village of Skjervøy. The day before, after climbing Arnøyhøgda, I had said goodbye to my friend Åke when he took the coastal steamer, Hurtigruta, in order to get back to Tromsø. I got up early and had to wake up the (sleeping) receptionist in order for her to let me out. The day was cloudy, in fact the higher mountains disappeared into the clouds. It still seemed like a perfectly nice day to make a hike and Store Kågtinden was the obvious target. I left the hotel rather early and took my car across the Skjervøy bridge and to the trailhead, arriving there shortly after 0600. I started skiing up the hill around 0615 and my progress was good as I got around the Storbuktvatnet lake and gained the 496 meter saddle at the base of the mountain. There was no snow as far as I could see, thus I left my skis behind at this point. I knew that I should traverse, still I ascended too high too early. It is difficult to find the very best line when the fog is as thick as today. There were several more or less parallel snow slopes that disappeared into the fog above. Rocks and no snow in between. Much easier to ascend on this snow.. Before I knew it, I had reached almost 900 meter of elevation, the terrain above did not look nice anymore. Worse than this, to traverse horizontally did not look good either. 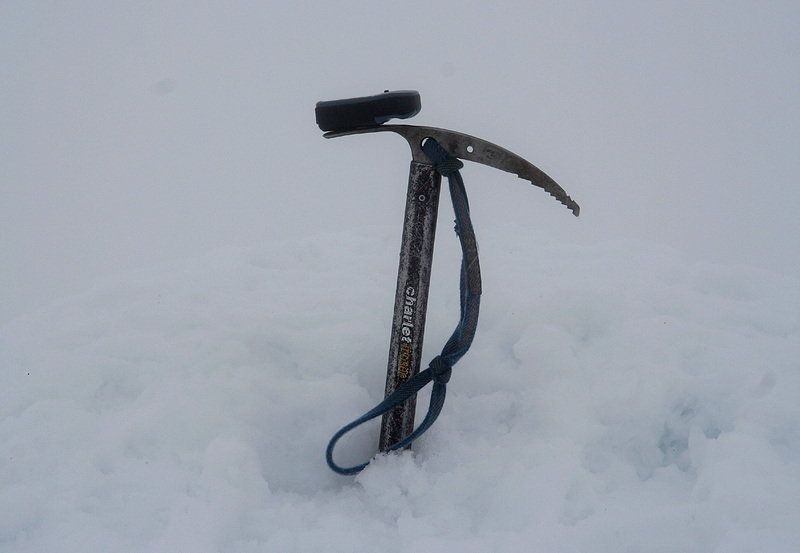 In order to reach the ridge, I needed to traverse a couple of snow gullies. They looked steep and an avalanche was not what I wanted. Looking down, the slopes just vanished in a somewhat intimidating way. I told myself that the terrain was less steep further down, but what you cannot see is sometimes hard to trust. After some slight struggle, I made my way across to the ridge following a route that seemed pretty safe. Once there, I ran into a set of old foot prints going uphill. From now on, things were quite easy and I reached the summit at 1000. I had a piece of my chocolate and some water. It seemed clear that there would be no views so I started back down around 1015. As soon as I descended below 800 meter, I got below the clouds. this was better than on ascent, the clouds were moving higher. 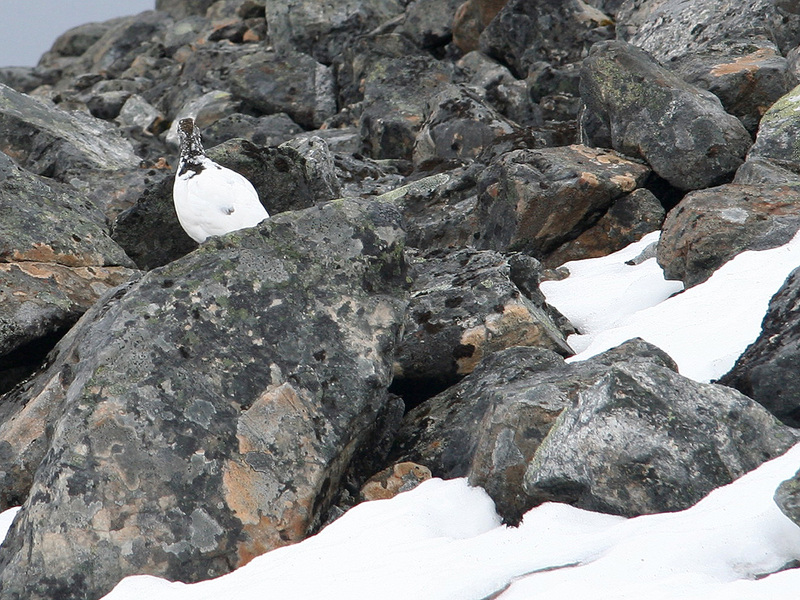 A ptarmigan flew up from some rocks right in front of me, the first sign of life, that I was not alone in this world of snow and rocks. She landed just a few meter further down and I decided to get my camera out and try to capture a picture. Just under the clouds by now, the view to the fjord was actually very nice. I got my picture, but remained in the area for a little more. 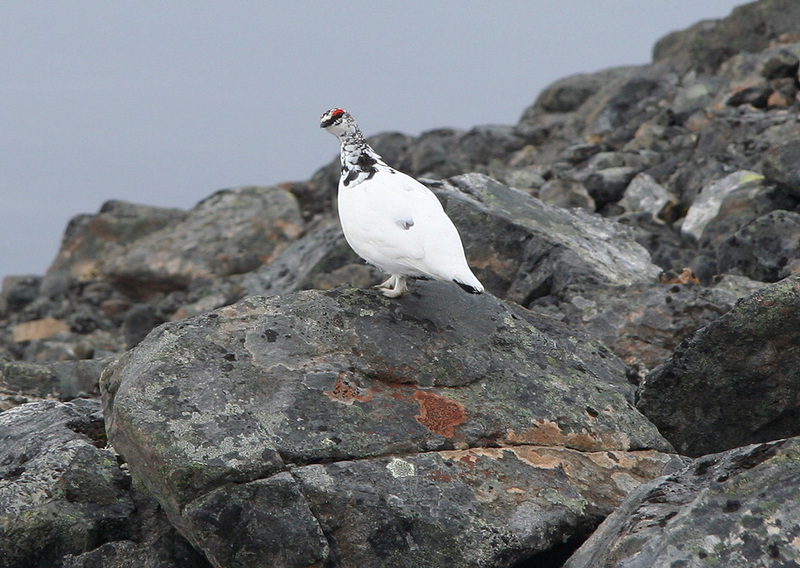 We shared a common view, the ptarmigan and I, a view of a pretty arctic environment, 70 degrees north on the first day of June. Right there and then I felt that we both shared something bigger than the view, we shared the completeness of all nature around us. Very different as we were, but still perhaps more similar than either of us would readily admit? I made the car by 1200 noon. It had been a good trip. Some mountains will always have fog and little or no visibility when you visit. However, there are so many other aspects to a hike in the mountains. Perhaps these other moments are more easily absorbed and remembered in the absense of bright sunshine and panorama scenery? Your brain is given time to observe and reflect on the immediate surroundings. I drove to Nordkjosbotn and stayed overnight there. 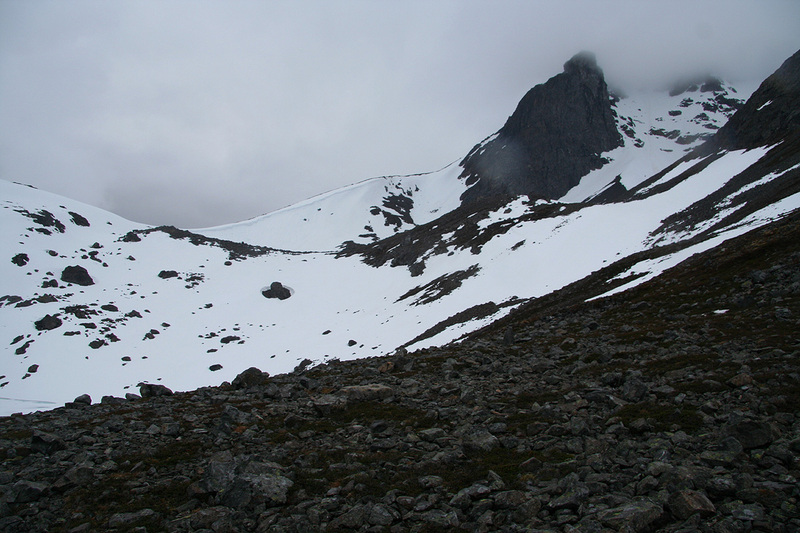 The next day would be an attempt to climb Rostafjellet. The approach, Storbuktvatnet is far left, the 496 saddle is straight ahead. On the summit, it was completely foggy, but a small metal sign giving the precise elevation was visible nearby. 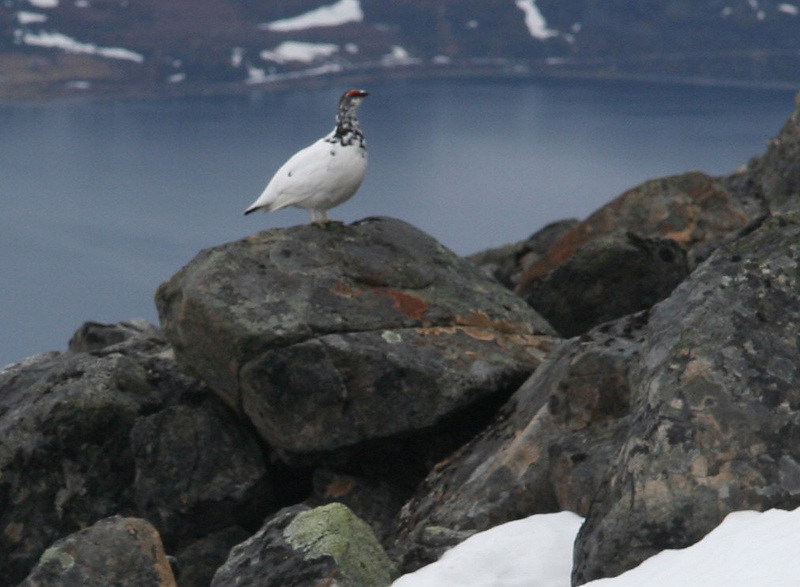 Getting below clouds, a ptarmigan is also enjoying the view. 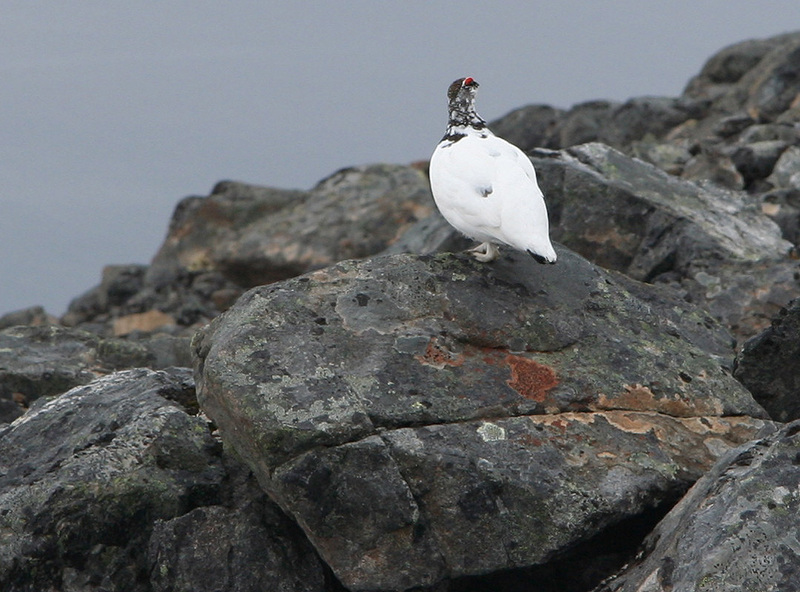 The ptarmigan, we shared a few good moments right here.